Anything related to Microsoft Axapta & Microsoft Dynamics Ax Enterprise Resource Planning (ERP) system. 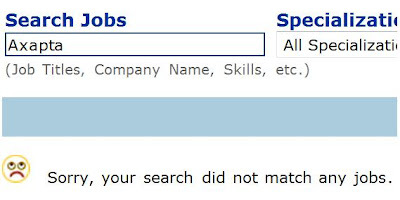 I did a search in Jobstreet Malaysia using the word SAP just now, the number of jobs returned was 438! Initially I thought the search engine might have included everything that starts with Sap, e.g. jobs such as "Sapu lantai" in the results. But it didn't, those were all real SAP openings. That's a lot of jobs. 438 is a lot of people, about 20 bus load? Imagine 20 bus load of consultants. What do you think they can do? 20 bus load of SAP consultants. Compared to a frowning face for ZERO JOB. If you are an Axapta consultant in Malaysia, good luck to your future. That frowning face is telling you "YOU ARE NOT NEEDED". But if you look on the bright side, may be it means you are doing such good job that all the companies using Axapta or Dynamics-Ax do not need additional help. They are 100% satisfied. What's your opinion? Do you think companies using Axapta really need less supports? What's in their Fixed Asset Ledger? One of the good things about Dynamics-Ax is that almost everything can be uploaded. When we implement fixed asset, we can get a fixed assets list from the client and upload it. What do we normally see on the fixed asset list? Usually I see machineries, computer equipments, buildings, land, and of course the boss's Merc S350 which is in everybody's way when walking in and out of the main entrance. Although your boss may say you are the most important asset of the company, but he always forget to put your name next to his S350 in the asset list. It seems the world's biggest football club Real Madrid is an Axapta user. I wonder what's in their fixed asset list. Do you think they put Raul, Ruud van Nistelrooy, Arjen Robben in their fixed asset ledger? They spent €18 million on van Nistelrooy, €36.55 to buy Robben. All these money should be in their fixed asset right? I wonder how their implementation went. Imagine their project kick off meeting, they can really do a kick off by asking one of their striker to score a goal or something. A reference site visit there would be fun. May be check out their fixed assets, do a fixed asset count. We are one of the Microsoft Certified Business Solutions Partner in Malaysa specializing in Microsoft Business Solution – Microsoft Dynamics Ax. Our primary objective is simple, that is to provide quick and concise enterprise solutions to our clients.